A stack of shipping containers sits in a lot in an industrial section of Phoenix. It has some developers thinking inside the box. The structures are usually used to transport cargo. Now, they have been transformed into eight apartments. Scuff marks, old serial numbers and shipping company logos remain. But a look inside each unit reveals a 740-square-foot modern home. "It doesn't even feel like a shipping container. 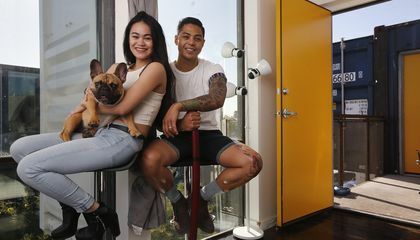 It's also insulated really well," said Patrick Tupas. He is in the Air Force. He and his wife signed a one-year lease for $1,000 a month. "It just feels like a regular apartment." There was a downside, he said. Passers-by ask questions and sometimes press to see inside their home. Housing and retail projects using the containers have popped up in recent years. They can be found in Las Vegas, Detroit and Washington. Developers and cities want to cater to millennials and baby boomers. Many want to live closer to the cultural offerings in urban hubs. To meet those needs, "cargotecture" has become a quick way to fill urban housing gaps. "They are faster, cheaper and now potentially have much more of an aesthetic range," said Dana Cuff. She is the director of cityLAB, a think tank at UCLA. It looks at architecture and urban growth. Some mask their shipping origins, but the ones in Phoenix don't, she said. "They're celebrating them," Cuff said. 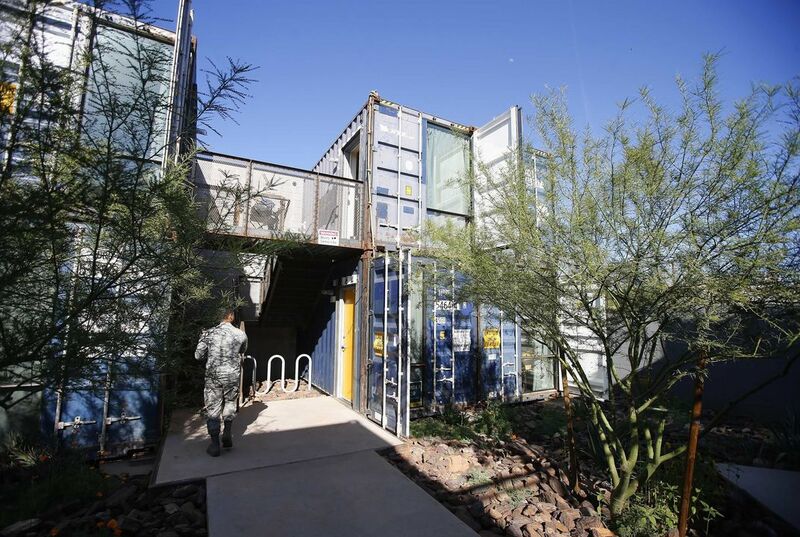 The architecture firm StarkJames designed the apartments in the Containers on Grand project in Phoenix. They retained the corrugated metal exteriors. Each unit is made of two containers. Inside, there are no signs of the cargo hauling days. The walls are painted white. The original wood flooring is encased in epoxy. There is enough space for a bedroom and living area. The two rooms are connected by two separate hallways. One hallway has the kitchen, oven and some counter space. The other one has closet space and a nook. There is also a washer and dryer unit. Monthly rent averages about $1,000. All but two of the eight units are occupied. One is being marketed as a vacation rental. University students and young professionals have been living in a four-story housing cluster in Washington's Brookland neighborhood. It's been open since September 2014. In Las Vegas, containers make up the building blocks of a downtown retail complex. In Detroit, Three Squared Construction is working on $14 million in new projects. They involve shipping containers because they save time. The company erected the city's first residential shipping-container development in April 2015. The three-story building is used as a showcase with the top floor periodically rented out. CEO Leslie Horn said there's been a high demand among millennials and "empty-nesters." Containers only save about 5 percent in lumber costs. Much more is saved in terms of time spent. "You're saving a lot of time by getting it done faster," Horn said. StarkJames is located in Scottsdale, Arizona. It is on track to build 12 more container homes. They will be in downtown Phoenix. They will be stacked three-stories high. Despite the progress, they still get teased by others in the industry. "We work with a lot of other developers," architect Brian Stark said. "They always ask, 'How are the garbage can homes going?'" But the firm is taking the teasing in stride. The downtown development will be called The Oscar. That is after Oscar the Grouch. His trash can makes him the only container-dweller on "Sesame Street." Why do shipping containers make good homes? They're big to fit about 5 people mabey and they dont rust. They are 740 square ft. and they don't rust inside or outside. Shipping containers make good homes because its not much money.